Two years ago I devised a plan to better evaluate front offices besides the typical wins and losses used by many casual fans. I perform this evaluation by creating specific metrics using preseason projected statistics and then compare those derived metrics to the ones calculated with the final statistics at the end of the year. My approach is driven by the simple model of the firm and the many economic principles that go along with that method. The economic fundamentals used in my research have been slightly adapted to fit the constraints of baseball. For example, instead of dollars, the WARP stat might be used to calculate a value. Also, certain economic equations break down when using them in a pure baseball sense, so alterations and in some cases new equations were needed to comply with these baseball controls. I will do my best to explain these adaptations as I go along. In the following models I have chosen to use WARP in place of dollars. There are two main reasons I chose to use WARP. First, it can be universally applied to pitchers and position players much like a form of currency. 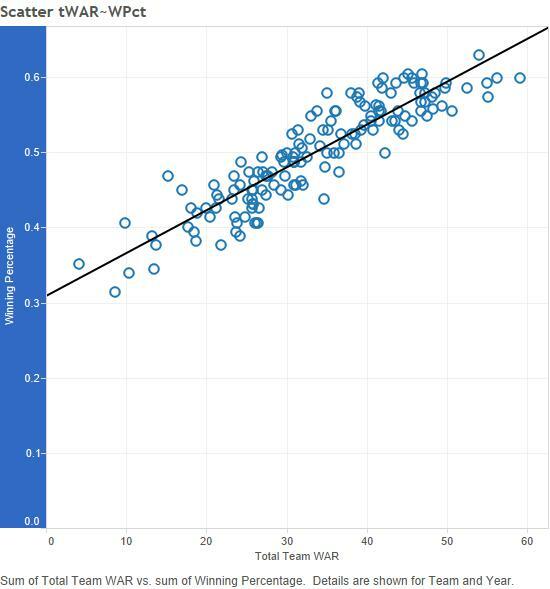 Second, team WARP is nicely correlated with team winning percentage as you can see in the chart below. The first concept I attempted to apply in this front office evaluation project was that of economic profit. Comparing economic profit to accounting profit is the first step in understanding how this can be applied to baseball. Accounting profit refers to the actual revenue calculation of a firm. This is the hard dollars and cents. Economic profit is more theoretical and attempts to factor in opportunity costs. In my baseball model, accounting profit is replaced by total WARP. Total WARP is the sum of WARP produced by each player during a season. Economic WARP (eWARP) takes the place of economic profit. Instead of looking at team WARP to evaluate a club’s performance, we can look at eWARP, which accounts for the lost opportunity cost of players traded, released, or in some way removed from the team prior to the current season. I used eWARP as a baseline to evaluate the moves made by front offices this past offseason. I will build on this metric later, but first lets take a look at how MLB teams ranked against each other using eWARP. (NOTES: Last year I used Baseball Reference’s WAR stat for this project. This year I began using Baseball Prospectus’ WARP stat for the pre-season front office evaluations. It just so happens I used WARP for the end-of-year evaluations as well. At the end of this exercise I will take a look at how well PECOTA – Baseball Prospectus’ proprietary forecasting model – did in my formulas (eWARP and GDW) that help discern how well front office managers performed with respect to their offseason transaction decisions. Let’s start by analyzing the bottom of this list which includes the Reds, Tigers and A’s. These three teams are a good distance from even the bottom of the pack as they all have an eWARP of less than 12. The next team up on the list has an eWARP of over 15. Since eWARP is mostly dependent on Total WARP, it makes sense for the A’s and Reds to be near the bottom of this list since their team wins above replacement – according to Baseball Prospectus – was the fourth and fifth worst in all of major-league baseball. Detroit is the anomaly at the tail end of the list. The Tigers had a below average team WARP (28.76) in 2016, but it is the high export value of the past year and offseason that put them in the cellar. If we take a closer look we can see how this happened. David Price, Yoenis Cespedes, Hernan Perez, Ian Krol and Jefry Marte combined for 16.55 WARP in 2016 for teams other than the Detroit Tigers. That is 16.55 WARP the Tigers gave up in 2016 just from those players. In total, the Tigers saw a lost opportunity of 17.89 WARP in 2016, the highest of any team by a wide margin. You might be asking yourself – What about the Diamondbacks?. On paper Arizona had one of the worst offseasons in the modern era considering the number of high valued prospects they gave up. Economic WARP suggests that Dave Stewart and company landed in the middle of the pack on how they handled transactions this past season. This is simply a flaw with my system. Economic WARP and gross domestic wins – which will be explained later – does not take into consideration the future value of prospects that were part of these transactions. The formulas only receive inputs of players’ present value (this is not the present value adjusted for future output). Therefore, teams like the Diamondbacks who gave up the farm to get a few veteran players, in reality, would have a higher lost opportunity cost which in turn would lower their eWARP ranking. The next concept I used to evaluate front office moves was gross domestic product. Like with eWARP, I used wins as the form of currency which allowed me to shift the metric to gross domestic wins (GDW). GDW allows us to isolate the transactions made by general managers even more so than eWARP. It allows us to compare the players a club acquires versus the ones they let go in the context of wins above replacement. I had to alter the GDP formula to fit the model of a major-league organization. GDW can be determined by adding the sum of the wins above replacement for the team’s call-ups and the wins above replacement of their net imports. The GDW list from best to worst. This time let’s start by analyzing the top of the list. The Cardinals front office takes the top spot in 2016 followed by the world champion Chicago Cubs. Remember – unlike eWARP – GDW is not dependent on total WARP. GDW isolates the actual transactions – the imports, exports and call-ups. The Cardinals took the top sport because they excelled at all three categories especially the imports and call-ups. They had the second highest import and call-up value only trailing the Mets and Rockies respectively in those categories. Jedd Gyorko and Mike Leake – both new to the Cardinals in 2016 and considered “imports” – had great years combining for nearly 7 wins above replacement according to Baseball Prospectus. The Cardinal call-ups didn’t do to shabby either. Aledmys Diaz and Seung Hwan Oh recorded 4.07 and 2.26 wins above replacement respectively. The most interesting slots on this list – in my opinion – are the ones occupied by the Atlanta Braves and Colorado Rockies. Based on my analysis both seem to be poised for near future success. The Braves’ front office ranked seventh on this years GDW list in spite of their call-ups combining for a -0.36 WARP. The Braves ranked high because of the significant difference between their Imports and Exports. The 2016 production of the new players they added to the roster was much better than the production of the players they removed or traded away. 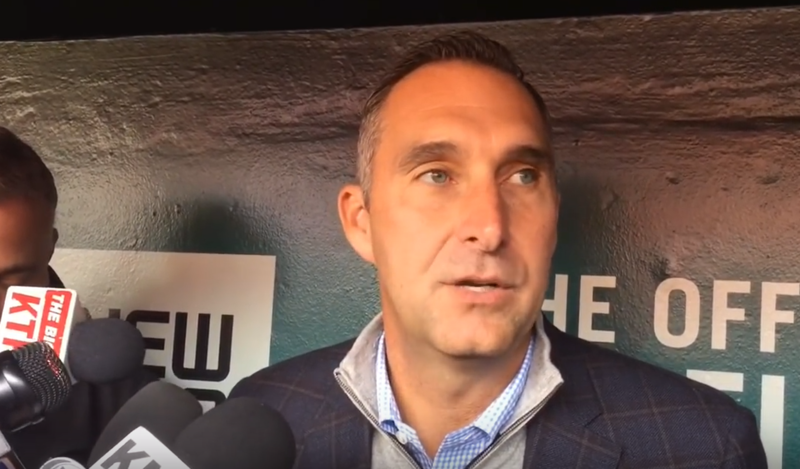 The reason I find the Braves intriguing is because their front office – in the short term – seems to be making moves to keep them competitive while at the same time getting rid of waste. This is reflective in their GDW number. It is the variable that did not help their GDW number in 2016 (the call-ups), that gives me reason to believe Atlanta is on the cusp of greatness once more. According to most team prospect lists – including Baseball Prospectus’ Organizational Rankings – the Braves rank near the top. They have stocked up their farm system and while a few contributed this season, there is seemingly more production to come. Once the young players start to find their way to the big league club you could see them begin to compete for division titles once more. I find the Rockies equally as interesting as the Braves in that I believe the Rockies are very close to putting together a run of winning seasons. This past season Colorado may not have made the best short term moves as their GDW value would suggest. They ranked thirteenth on the list due to a low export to import ratio. While the new non-call-up players made little impact, their call-ups did. In fact Colorado’s farm system call-ups (not only eligible rookies) combined for the most wins above replacement of any team in major-league baseball. Where the Braves need a boost from their high-quality prospects, the Rockies are already getting that and need a boost from new or returning veterans. Prior to the beginning of the 2016 season, I used Baseball Prospectus’ PECOTA projections to calculate each teams’ estimated gross domestic wins. I used the same formula for GDW as the one above and plugged in the forecasted WARP values. Generally speaking I would say PECOTA was fairly accurate when it came to predicting which teams front offices made better transactions prior to the 2016 season. Six out of the top ten teams on the end-of-season GDW list were also in the top ten on the PECOTA projected list. There was one glaring mistake made by PECOTA. The Cardinals took the top spot on this seasons GDW list; however, PECOTA had them pegged at third from the bottom. Part of the reason PECOTA was off on the Cardinals is because it didn’t predict break out years from a few of their key call-up/rookies. Cardinal imports such as Mike Leake and Jedd Gyorko also greatly outperformed their PECOTA projections. Another miscue from PECOTA was the Braves. The pre-season GDW list had them five from the bottom and the final GDW rankings has them at number six. It over estimated many of the team’s exports such as Shelby Miller and Andrelton Simmons to name a couple and under estimated many of their imports (new guys) like Ender Inciarte and Tyler Flowers. The pre-season front office evaluation was not an attempt to thoroughly judge PECOTA projections. It was simply a way to estimate the quality level of moves made by front offices around the league prior to the start of the season. The most important part of this exercise is not evaluating the pre-season projections, but analyzing the actual numbers which I briefly attempted to so with the entirety of this article. While we often judge teams based on their wins and losses at the end of the season. It is important to understand there is a lot more that goes into a successful season besides winning percentage. Teams have different goals each season. Some could have goals of rebuilding their farm system. Some could be looking to find undervalued veterans to put them over the top. Gross domestic wins and economic wins above replacement is my attempt at isolating one goal teams have each year, to make trades, signings, releases, assignments and call-ups that manifest into a positive value for the team.